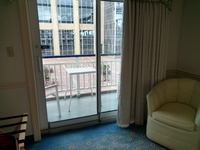 A picture of the balcony. 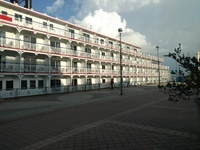 Picture of the ship docked in New Orleans. I’m a solo traveler, not a foodie, who was looking to this trip to simply relax. Not really into excursions and certainly not a foodie. I have the taste buds of 12 year old. I had a single balcony. 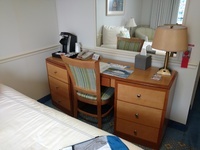 Compared to rooms on standard cruises, it was a palace. 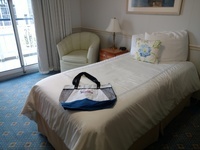 It was larger than a standard stateroom. For those who share my coffee addiction, the room had a Keurig to make your own coffee in. The walls are thin though, so if you are the “early to bed” type, bring some decent ear plugs. For those of you used to regular cruises, the bathroom will be a pleasant surprise. It was a decent sized and had a real shower with a glass door. I had read how unreliable the wi-fi was, but had good luck with it except for one morning. It was nice, and plenty of comfortable places to relax. With only around 180 people on the boat, no place was ever crowded and if you wanted solitude you could find it. There were 2 lounges which the staff did an excellent job of keeping stocked. Coffee, soda, juices and snacks (Sun Chips, peanut butter crackers, breakfast bars, that type of thing), and an ice machine. 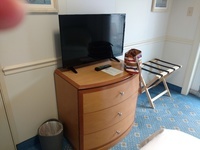 The ship had laundry facilities – 2 washers, 2 dryers, Tide pods and dryer sheets. Exercise room. 2 bikes and 2 elliptical machines, plus 2 other machines for weight training. This was the only negative for me, and there isn’t much to do about it. There is only one choice on the ship, and that is to eat in the dining room. I did miss being able to choose just having a quick lunch at the buffet or the deli on a regular cruise. When you eat on the boat, you are making a commitment to typically 60-90 minutes as you have an appetizer, entrée and dessert to get through. Each evening dinner was at 6:30 p.m. and at 5:30 you could get drinks and snacks in one of the lounges. At dinner, there was a bottle of white wine and a bottle of red wine on the table. You can bring whatever alcohol you like on board. They don’t have any place to purchase drinks. The food itself was OK (I’m not a foodie). You typically had 2 choices for the appetizer, 4 for the entrée (one being Vegan), and 2 choices for dessert. The wait staff worked hard. You could get room service breakfast, and I never did that so can’t speak to it. Usually an hour before breakfast in the dining room, they put out muffins and juice in the lounges, so that ‘s what I ate. I only did breakfast in the dining room once. I was very concerned about the dress code, and some people did dress up for dinner in the dining room, but not everyone. Where what makes you happy. it was nice. Definitely large enough. The room had a Keurig to make coffee in. The temperature control worked very well. The wi-fi was mostly reliable except for one morning. The bed was small, but comfortable. I would definitely recommend ear-plugs though if you are early to bed or late to rise. Great bathroom with a real shower with an actual door. A decent sized vanity as well.